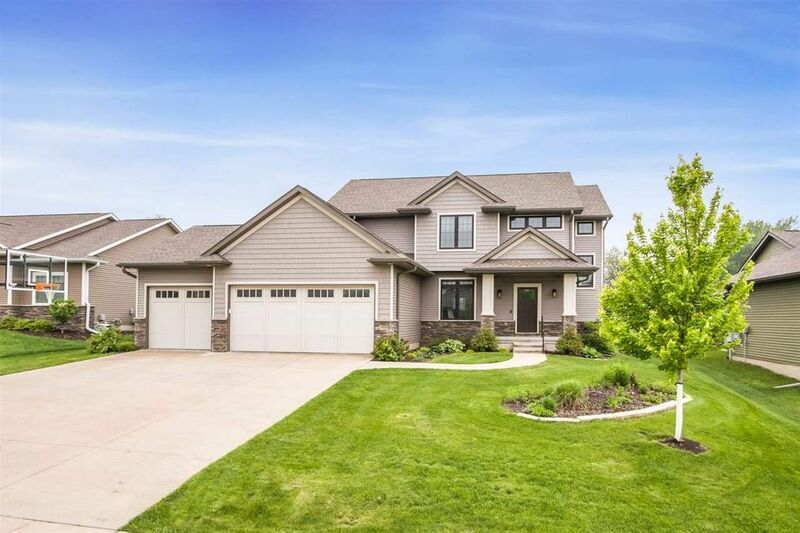 Captivating craftsman style 2 Story with some impressive amenities conveniently located in N. Coralville close to schools, walking trails and the Youth Sports Complex with a wonderful large usable yard! Special features include some gorgeous custom wood finish details including columns, crown mouldings over windows and doors and a floor to ceiling stone fireplace with wood shelving and glass door cabinetry; delightful kitchen that boasts rich stained wood cabinetry, granite countertops, island with raised bar, shiny stainless steel Bosch and GE appliances including a gas range/oven and French door style refrigerator along with a professional grade hood vent, handy walk-in pantry, glass tile back splash, and under cabinet lighting; maple wood flooring through the main level; elegant formal dining room; mud room with a built-in desk and bench with cubbies; half bath powder room; 9 ft. main level ceilings; 4 generous sized upper level bedrooms including a 15x16 master suite with a designer tray ceiling, 9 ft. deep walk-in closet, and soaking tub with separate all tile shower; 2nd floor laundry room with utility sink; expansive lower level rec/family room with rough in for a wet bar; solid wood doors and oil rubbed bronze lever style hardware along with stained wood trim; 9x13 finished storage room plus another 9x13 mechanical room with more storage; screened porch and adjoining patio with natural gas provisions for your grill; 862 sq. ft. 3 car garage with floor drains, hot/cold water, and 26 ft. deep 3rd stall; high efficiency Lennox equipment; invisible fence; central vacuum; Andersen Windows; wired for audio; 2 newer water heaters; custom Bali window treatments; and an attractive stone and shake front elevation! Directions: 12th Ave. to Forest Edge Dr. to High Bluff Dr. or use Maplewood to Ash St.